Honda Beat FI V1 2015 aquired 2016. In 2015, The Honda BeAT-FI series first hit the Philippines market and was designed keeping in mind the young customer base. The Honda BeAT-FI has undoubtedly been one of those who has been successful in acquiring the market share it desired. It had generated a good amount of sale all because of its unique design. The Honda BeAt FI comes with a unique design which makes it suitable for both men and women riders. Compared to many other two-wheelers, its sales do not depend on just one gender. It targets all the young and trendy, the Honda BeAT-FI got an update in 2017 after its launch in 2015. The update triggered to comply with the emission regulations. After this, it resulted in making the automatic scooter even better in terms of fuel efficiency and power. The new Honda BeAt FI now comes with an idle stop-start system that allows it to get mileage figures of up to 63kmpl. It comes equipped with Honda's combi braking system in which makes it easy to brake without nosediving. It has that stylish sticker work and body panels make it especially appealing to all its target customers. The Honda BeAT-FI is comparatively lightweight and comes with a nice sloping seat that surely makes it comfortable for any type of people, especially shorter ones. The New Honda BeAT-FI has a compact dimension which measures at 1,856mm in length, 665mm in width, and 1,065mm in height. When it comes with its wheelbase, it measures at 1,256mm, which is quite standard for all scooter rides. The Honda BeAT Fi has a big headlight which comes along with a stylish silencer cover that makes this scooter vaery appealing. The Honda BeAT-FI runs on a 110cc air-cooled engine which is very capable of generating a maximum power of 8.5hp at 7,500rpm along with a peak torque of 9.01Nm at 6,000rpm. This scooter from Honda is one easy to handle and offers a really pretty good smooth kind of performance to any type of road condition. For its transmission, it is partnered with a CVT transmission and telescopic suspension at the front which really performs well. This scooter only has a 4-liter fuel capacity, which is quite small for its category. When it comes to its braking and safety features, the Honda BeAT-FI uses its front disc brake along with a rear drum brake. The Honda's Combi-Brake system which is part of the Honda BeAT-FI allows it to use both the brakes by pulling the left lever simultaneously. Since it has the Idling Stop-Start System or known as the ISS, this helps all riders save more fuel by stopping the engine when it is idle for too long. It also comes equipped with a magnetic shutter which covers the keyhole. The Honda BeAT-FL uses the Honda Smart Technology, this is also considered as an advanced technology which was first used in the Honda Click 125i. This new technology is a collection of innovative features that enhance safety and road performance. It has a remarkable fuel efficiency of 63kmpl in its CBS and ISS variant. For its standard model, it only offers a mileage of 58.5kmpl. It has an economical mileage which is one of the primary reasons for the Honda BeAT-FI to be one of the leading vehicles in the market. Aside from the fact that it is fuel efficient, this is one of the main factors for the success of any two-wheeler and Honda very much aware of that. The Honda BeAT-FI also has several new and advanced safety features as we have seen in almost every Honda scooter and bikes. This includes a side stand switch, park brake lock, secure magnetic key shutter, Automatic Headlight On (AHO) as well as the combi-brake system. 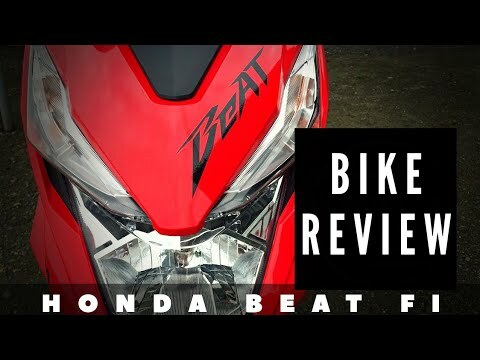 Honda makes sure that it provides consumer convenience for its riders, and the Honda BeAT-F will definitely give that complete satisfaction to all of its consumers. The Honda BeAT-FI also offers a large utility box that can accommodate around 11.2 liters of personal stuff or safety equipment. For more of its new features, it also includes the Enhanced Smart Power, which comes with several technologically advanced features. The ACG or also known as the Alternating Current Generator is a starter-type system ensures a noise-free and smooth start. The PGM-FI technology, this was first introduced by Honda in the year 1982 with its Honda CX500 Turbo provides higher torque, power, and fuel efficiency while keeping the emission low. It also includes the CVT (Continuous Variable Transmission) in which can now be seen in most of the modern scooters allows for low vibration and friction. All these advanced features and new technology is coupled with a great design an excellent performance, the new Honda BeAT-FI has been a hit since its inception. Honda, as one Japanese manufacturer has always tried to stay a step ahead of its rivals, and these innovations have been their mantra for success all these years globally. gaano po kalaki ang storage ng motor na ito? meron din po ba o need pa talga bumili ng bag sa likod? all the honda beat fi model had a combination brake?